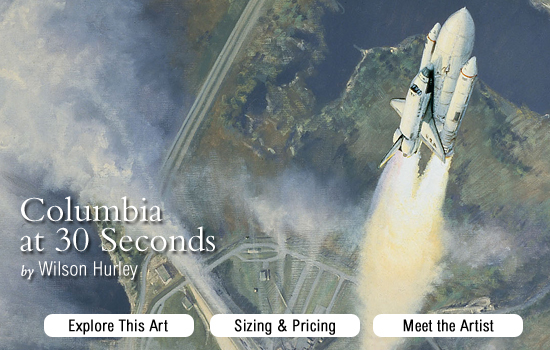 Columbia at 30 Seconds captures the space, distance, power and velocity that made the launch. 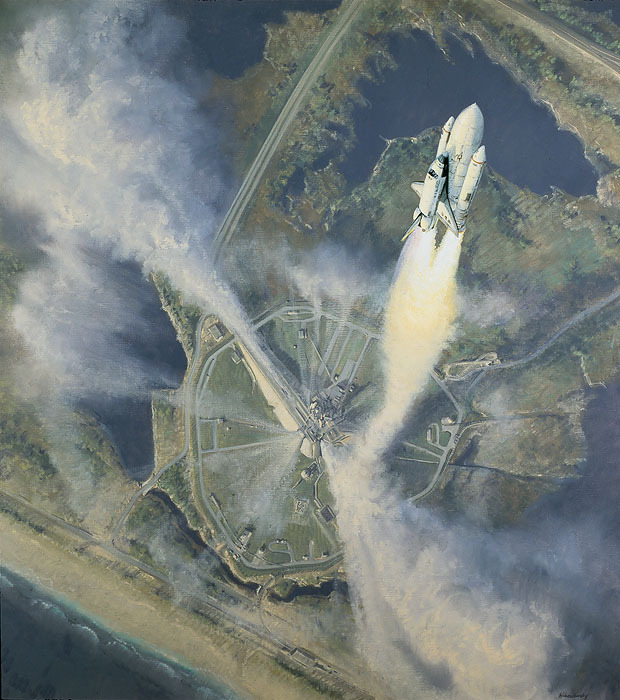 Looking up or across at the launch would have made the shuttle just a tiny speck in the painting. Further, the view most people have of the shuttle comes from television where long telephoto lenses tend to flatten everything. With the background sightly bowed, the shuttle craft took on the proper perspective as it hammered its way into the heavens. 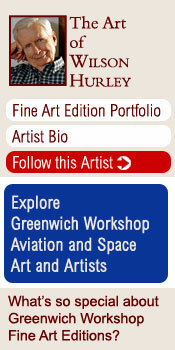 The decision to become an artist is not always easy. It took Wilson Hurley decades and two careers before he followed his muse. But his experiences added to his vision, making him one of the most respected landscape artists in the world and perhaps best known for his primordial portraits of the American West. One of Hurley’s most monumental accomplishments is the creation of five unique American vistas, Windows to the West–a series of forty by sixteen foot triptychs–which hang in the National Cowboy Hall of Fame. These classic American works are worthy of the Hudson Valley School of Artists’ maxim: "If you wish to see God’s work, look about you." Hurley was born in Tulsa, the son of a lawyer who was to become Secretary of War in President Herbert Hoover’s administration. Following a military career and a World War II assignment he practiced law in New Mexico, where spectacular views of the West fueled his hobby of painting. Then came the fateful appointment with a dying client, a terminally ill doctor who consulted Hurley about a will. With the knowledge of mortality forefront in his mind, Hurley decided to devote the rest of his life to art. This devotion led him to become one of the leading landscapists of our time, compared to such revered painters as Albert Bierstadt, Thomas Cole and Thomas Moran. 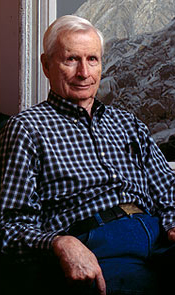 Hurley is a founding member of the National Academy of Western Art and the recipient of their highest honor, the Prix de West.